It’s harvest season, and for your junior farmer, that means a lot of miles on their favorite tractor. For as long as there have been farms, there have been young boys and girls playing farmer and getting dirt on their britches. The thrill of plowing fields, mowing hay and rounding up cattle is a strong temptation for many a would-be farmer, and a shiny red or green tractor can make both young and old farmers alike get a little short of breath. 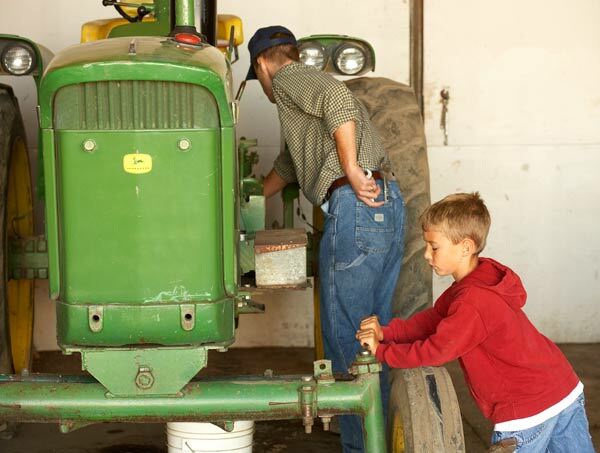 Whether you’re a big farm kid or a small farm kid, there’s always work to be done on your favorite tractor. JM Cremps has a full selection of the best farm toys, tractors, and farm tools you’ll find outside of a tractor store. If your young John Deere has a barn full of tractors already and seems to know more about farming than you do, then why not test your little farmer’s knowledge with this fun Farm Facts Quiz. Download and print your copy of the Farm Facts Quiz here. What percentage of all apples grown in the US are grown in the state of Washington? How many glasses of milk does the average milk cow produce in one year? How many honeybees does it take to produce a Tablespoon of honey? How many flowers are collected from to produce a Tablespoon of honey? Which state produces the most cranberries? How much broccoli does the average American eat each year? Approximately how many farms are there in the United States? How much water does the average dairy cow drink in one day? The average hen lays how many eggs per year? Get your Farm Facts Quiz Answer Sheet HERE. *Facts provided by the American Farm Bureau, National Farm-City Council, and the Ontario Farm Council.